As it now mid-February, it is now the time of year when I finally update you with my goals for this year. As you can see from the graph of my monthly mileage below, trying to run 80 miles a month was probably a bit too ambitious. 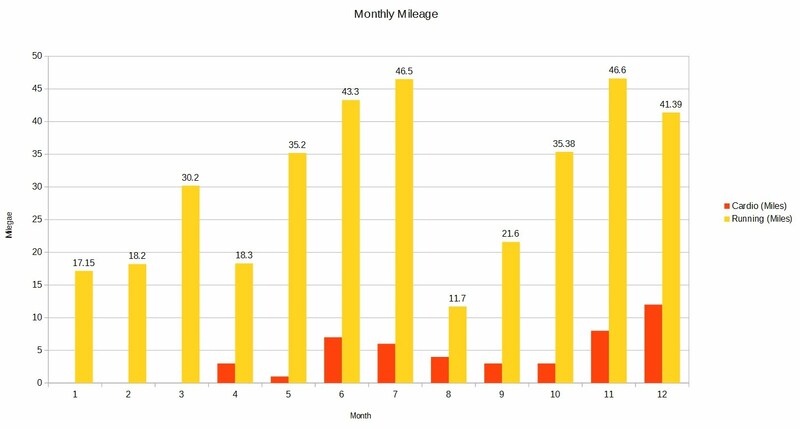 I averaged just over 30 miles a month over 2015, and was hitting over 45 miles per month once I got going. I ran in one Parkrun, the Ecos run in Ballymena on Saturday 10th January 2015. Frankly, this was just too big a goal, and would have meant giving up every other Saturday morning. I needed to make this goal a lot more manageable. Get fit – a definite fail. My end of year score in the Five Minute Fitnes Challenge was 182, actually down on my personal best of 194. My bodyweight at the end of 2015 was 78.4 kg at around 23% body fat – very poor. I started 2015 weighing 80.7 kg. Marry my girlfriend Mei – Yes!! 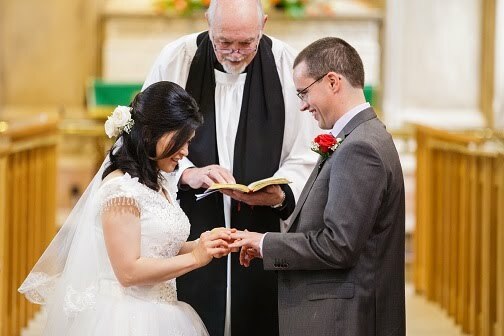 Mei and I married in the summer at St. Patrick’s church in Coleraine. The massive dip in my monthly running mileage was caused by the August wedding (and associated stress) and our honeymoon cruise to Norway. Run 12 Parkruns by end of 2016 – a slightly more realistic target! To blog a new article monthly, and to start focusing on generating more technical content for my blog. Migrate my blog away to a new blogging platform. Blogger was a good platform to start on back in March 2010, but it is definitely showing its age. It is time for a blog makeover!! Make more time for blogging by giving up Twitter for the year. I enjoy Twitter and I have some good conversations there – but I also waste a lot of time, and occasionally I get dragged down into exchanging bile and snark. I would rather spend the time on something more meaningful and long term, like my blog and other side projects. I’ll occasionally post links to my own content on Twitter, but otherwise I’ll be avoiding it. As usual, even if I don’t achieve my goals, I’ll hopefully learn or achieve something worthwhile. Best of luck with all your goals, especially looking forward to seeing more blog posts!